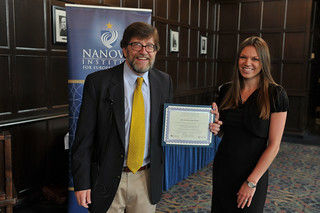 On Friday, May 16th, students graduating with a minor in European studies gathered with family and academic advisors for the Nanovic Institute's recognition breakfast. Students shared stories about their research journey for their capstone essay, a requirement to complete the minor, and received a personalized certificate to mark the occasion. The J. Robert Wegs Prize for Best Minor in European Studies Capstone Essay is awarded annually to the minor in European Studies who authors the best essay written in fulfillment of the capstone essay requirements for the minor. This prize carries a $250 award. The prize is named in memory of J. Robert Wegs (1937-2010), founding Director of the Nanovic Institute for European Studies who served until 2002. One of his contributions to the Nanovic Institute was the development of the Minor in European Studies. 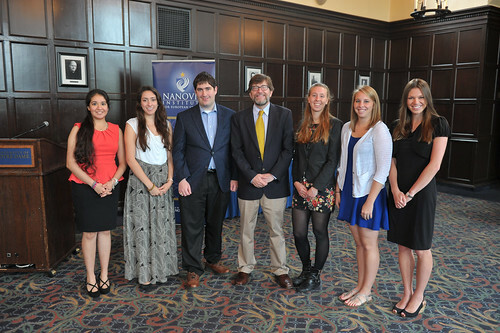 This year, the Wegs Prize was presented to English major Marielle Hampe for her capstone essay. She was advised by Matthew Capdevielle, director of the University Writing Center. Congratulations to all of our students and best wishes from the Nanovic Institute!